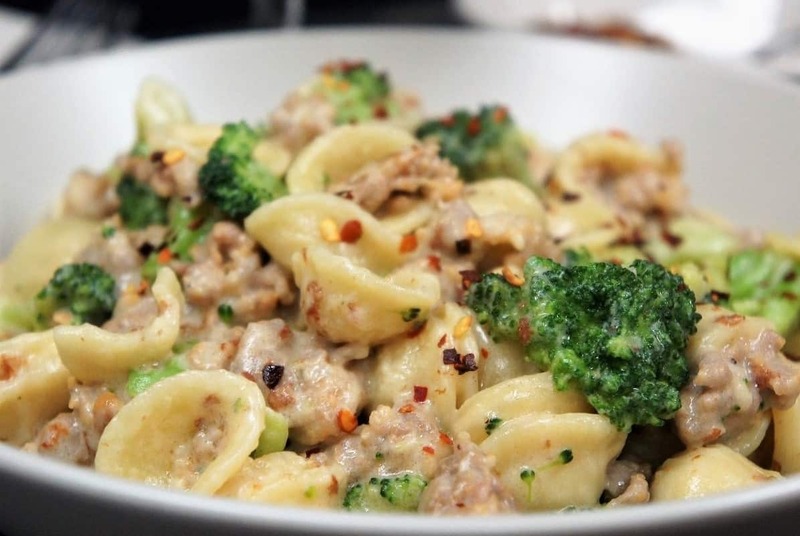 This orecchiette with Italian sausage and broccoli is a quick, easy and filling dinner that your family will love. 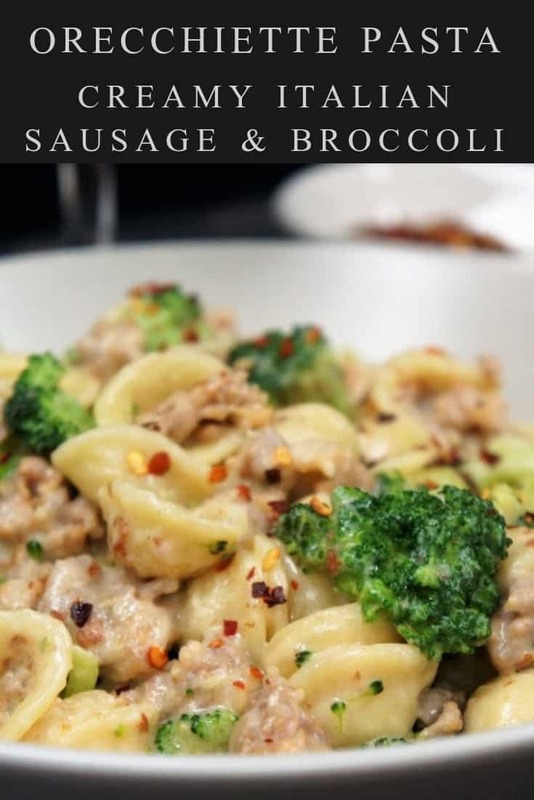 The Italian sausage flavors the sauce beautifully keeping the number of ingredients to a minimum. Plus, using milk instead of cream keeps the creamy sauce light. 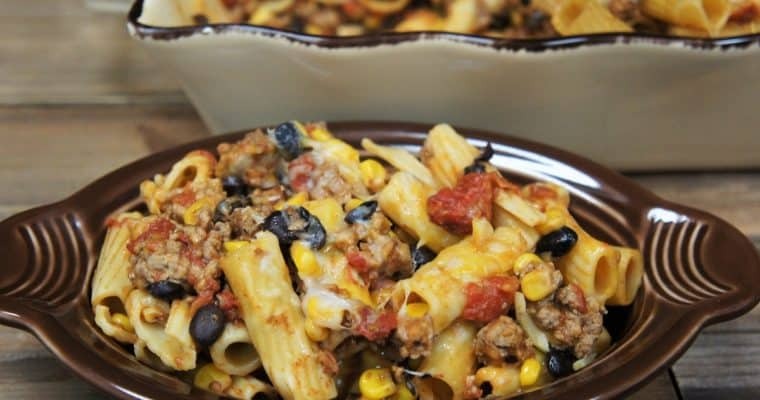 When I make this pasta dinner, I don’t expect leftovers! If you’re looking for more easy pasta dinners, try this blackened chicken & creamy pasta or this penne and vodka sauce. Enjoy! Heat the olive oil in a large, deep skillet over medium to medium-high heat. Add the sausage, stir, breaking up large pieces using a wooden spoon or a spatula. Cook the sausage for approximately 4-5 minutes, until browned, stirring frequently. Lower the heat to medium-low and add the garlic, cook 1 minute, stirring frequently. Add the butter to the skillet, when the butter melts add the flour and mix well. Cook for 2-3 minutes, stirring almost constantly. Add the milk, and Parmesan cheese to the skillet. Stir, while gently scraping up any bits off the bottom of the skillet, continue stirring until the ingredients are combined. When the sauce comes to a simmer, cover the skillet and cook approximately 10 minutes, stirring occasionally. Keep the sauce at a simmer, if it starts boiling too vigorously, lower the heat. Drop the pasta in the boiling water. Cook the pasta to package directions for al-dente. Remember to salt the water and to stir frequently. Before you drain the pasta, reserve about a cup of the cooking water, we’ll use it later. Drain the pasta. Cook the frozen broccoli to package directions. I use the lowest cooking time on the package, minus one minute. The broccoli is going in the skillet with the simmering sauce and piping hot pasta. It will continue cooking even when removed from the heat. Drain the broccoli well. While the pasta is still hot and steaming, add it to the creamy sausage sauce. Add the broccoli and about a ¼ cup of the reserved pasta water. Stir well until the ingredients are combined and coated with the creamy sausage sauce. If the sauce is too thick, add a little more of the reserved pasta water and stir well. Taste the pasta; add salt, if needed. Serve immediately with crushed red pepper and extra Parmesan cheese, if desired. While you’re cooking the sausage it’s very possible that there will be bits that stick to the bottom of the skillet. That’s ok; actually, it’s a good thing. Those bits that stick to the bottom are caramelized meat – it’s called fond and it adds a ton of flavor to soups and sauces. In this recipe we will deglaze the skillet (lift the bits off the bottom) using milk. When you add the milk to the skillet, gently scrape the bottom using a wooden spoon and work in a circular motion. 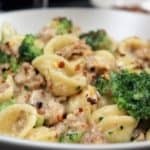 This orecchiette with Italian sausage and broccoli is a quick, easy and filling dinner that your family will love. Heat the olive oil in a large, deep skillet over medium to medium-high heat. Add the sausage, stir, breaking up large pieces using a wooden spoon or a spatula. Cook the sausage for approximately 4-5 minutes, until browned, stirring frequently. Lower the heat to medium-low and add the garlic, cook 1 minute, stirring frequently. Drop the pasta in the boiling water. Cook the pasta to package directions for al-dente. Remember to salt the water and to stir frequently. Before you drain the pasta, reserve about a cup of the cooking water, we'll use it later. Drain the pasta. Cook the frozen broccoli to package directions. I use the lowest cooking time on the package, minus one minute. Drain the broccoli well. While the pasta is still hot and steaming, add it to the creamy sausage sauce. Add the broccoli and about a ¼ cup of the reserved pasta water. Stir well until the ingredients are combined and coated with the creamy sausage sauce. If the sauce is too thick, add a little more of the reserved pasta water and stir well. 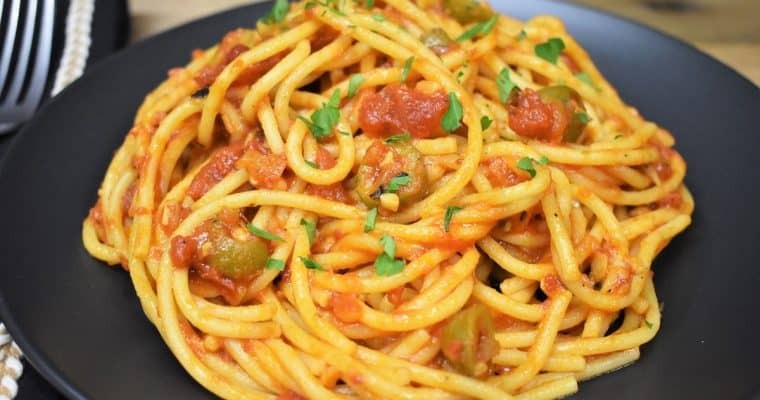 Taste the pasta; add salt, if needed. Serve immediately with crushed red pepper and extra Parmesan cheese, if desired. While you’re cooking the sausage it’s very possible that there will be bits that stick to the bottom of the skillet. That’s ok; actually, it’s a good thing. Those bits that stick to the bottom are caramelized meat – it’s called fond and it adds a ton of flavor to soups and sauces. In this recipe we will deglaze the skillet (lift the bits off the bottom) using milk. When you add the milk to the skillet, gently scrape the bottom using a wooden spoon and work in a circular motion.